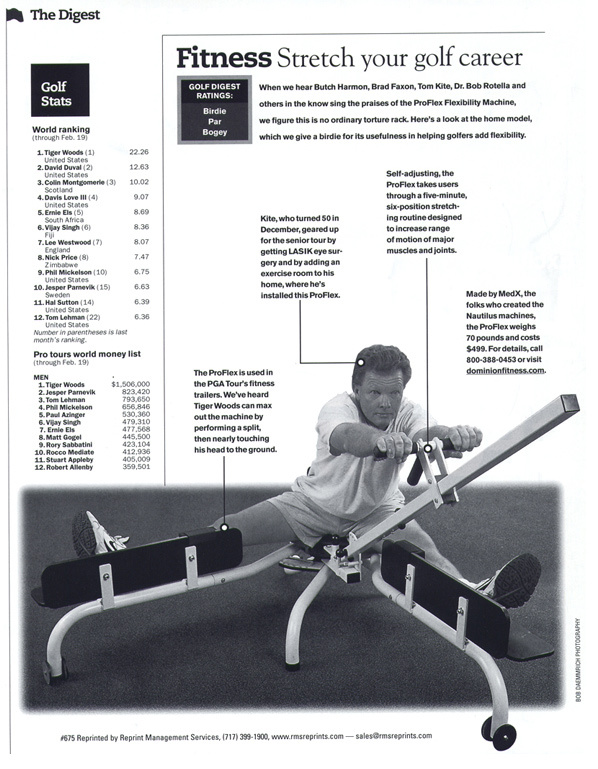 The ProFlex Stretching Machine was given the highest “Birdie” rating. ProFlex is designed to increase flexibility and range of motion. The ProFlex Stretching Machine was voted #3 new golf product. Proflex is used extensively by the PGA tour. What do you think of the Stretching that pro golfers are using? The machine to which you are referring is the ProFlex. It helps the user to stretch most of the major muscles in the body through six different positions while increasing upper- and lower-body flexibility. Initially developed for martial-arts students by Joe Lewis, a world heavyweight champion in karate, and David Dise, the stretching machine has become popular among professional golfers. In fact, the ProFlex is used in the PGA Tour’s fitness trailer. And many pro’s, including Tom Kite and Jack Nicklaus, use it in their home gyms. Butch Harmon, Tiger Woods’ coach uses the machine in his golf school. He told me: “if you look at the long hitters of today, the make very little hip turn on their backswing and a huge shoulder turn. This is not possible without good flexibility. Where once you might have had a full fluid swing, as you age you lapse into just punching the ball. This machine can help you maximize your physical potential as a golf athlete”. Joe Lewis noted, “The ProFlex can help to eliminate a lot of the injuries that result when people try to improve flexibility on their own, because it insures proper position”. To learn more about the ProFlex call 1-866-Proflex or visit the web at www.proflexstretch.com.